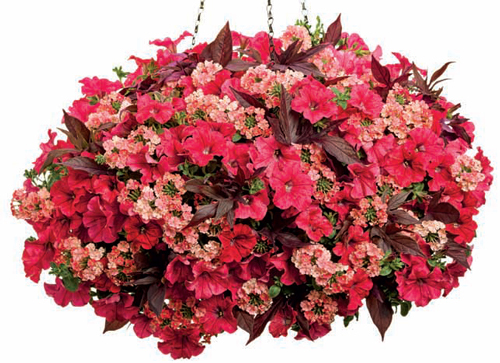 Our ‘Prairie Fire’™ Proven Winners® Combination puts on an absolutely flamboyant display! Planted with Illusion™ Garnet Lace Ipomea, also known as Illusion™ Garnet Lace Sweet Potato Vine; with Supertunia® Red and Superbena® Royale Peachy Keen™ , you have the makings of a combo with all the colors of a real, live prairie fire, with even some of the heat! The plants in our 'Prairie Fire' plants are grown and shipped in fine quality growing medium and are guaranteed to arrive alive and ready to thrive. Comment: The prairie fire combo is very pretty and at a great price. However the petunia needs lots of water.